Bean Buro has completed an unprecedented workplace consisting on serviced offices and co-working spaces that allow members complete freedom to adjust their office space and duration of uses to their evolving needs. Office bookings can be made as easily as booking a hotel for stays as short as one day. 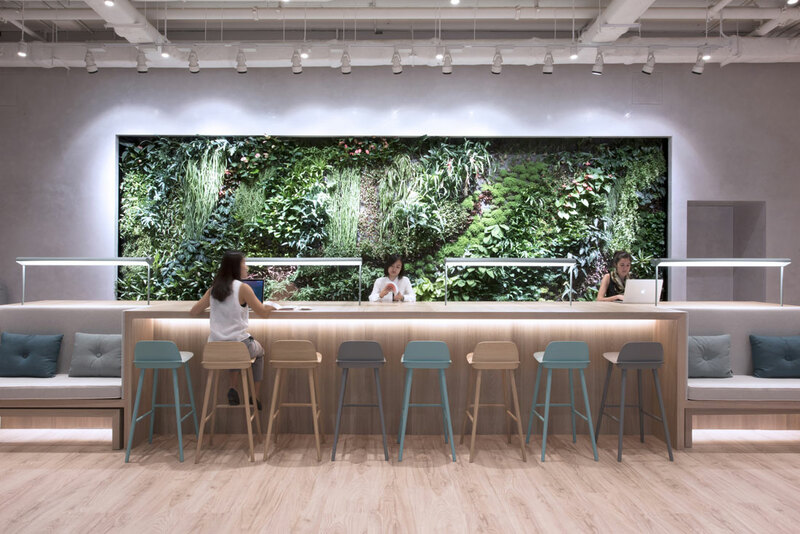 Located at Midtown in Causeway Bay, Hong Kong, the project is 33,000sqft (some 3,000m2) over four floors, with a dedicated social floor consisting of different types of shared workspaces and a vertical garden by the botanical pioneer Patrick Blanc. The workspaces are crafted to be the most complete environment for today’s workforce. Both the serviced offices and co-working spaces are created to deliver hospitality values and standards. Just the way the hotel sector is known for creating memorable guest experiences and comfortable stays, this project too has adopted a similar mindset, ensuring its members the feeling that coming to work is a true pleasure. 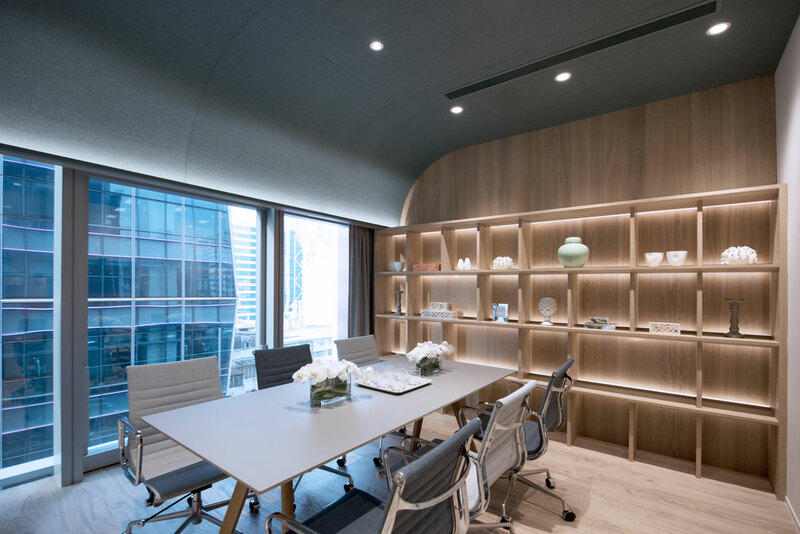 The design creates a multi-sensory environment to enhance productivity: Every single element – including music, scent, refreshment, technology, furniture, meeting facilities and amenities – has been carefully curated with the goal of improving productivity and work experience. Members are empowered with access to a range of facilities, services and thoughtfully curated amenities that will help accelerate their rise. The unprecedented solution makes serviced offices and co-working spaces rental easy, cost efficient and transparent. 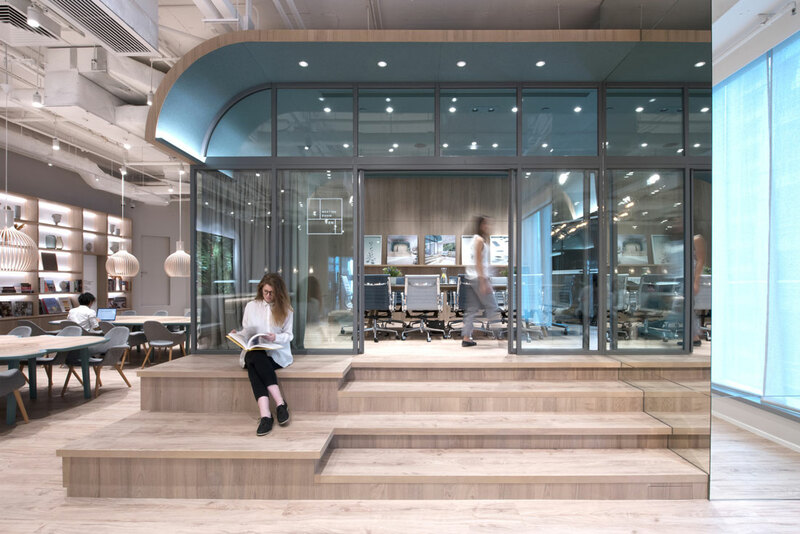 Members can choose a term that fits their requirement, from a daily basis to longer rentals, and have the flexibility to adapt and evolve a space, size and configuration to fit their changing work needs. The workspaces cater to teams of any size, are fully fitted and accessible 24/7. With the high ceiling heights, Bean Buro created a dramatic welcoming space with feature meeting rooms that are elevated. Each one is crafted with curved timber canopies lined with acoustic fabric soffits. The design concept for these sculptural meeting rooms was driven by the poetic interpretations of the history of the waterfront district and the dynamic atmosphere of the fishing community, who once gathered under boating canopies. Bean Buro’s sculptural approach naturally divides the floor space into private, semi-private and collaborative spaces. These spaces created in and around the canopies are: “The Stage”, “The Gallery” and “The Garden”. “The Stage” is designed to hold up to 110 guests. It is an impressive setting for showcases, media events, awards ceremonies, product launches, celebrations, social and business receptions, etc. “The Gallery” is designed to accommodate up to 45 guests at a time, and it is an ideal space for product launches, trunk shows and pop-up sales. “The Garden” is designed to hold up to 60 guests. Its name derives from the vertical garden designed by Patrick Blanc and it is ideal for tastings, showcases and media round table events. The finishes are coherent throughout, but subtly evolve through the different spaces. For example, timber is used as a coherent architectural finish, while pastel wall paints inject moments of calm, or dynamic paint patterns boost energy. Cork walls are provided for personalised pin ups and to create acoustic and visual warmth. The shared spaces are designed to increase chance encounters, such as at the lounges, work bars, and Bean Buro’s signature Bean Tables, which are sharing tables with playful curved edges that allow members to work individually while simultaneously encouraged to interact with each other. The private enclosed offices are designed to feel like home, cosy with good lighting, acoustics and calm pastel colours. Members can personalise their own space with the bookshelves and cork pin-up walls. High quality task chairs and height adjustable workstations increase the comfort level of the workspaces. The general office partitions are created with three tiers of metal, frosted glass and clear glass to bring as much natural daylight as possible into every office, whilst maintaining privacy.